This kind of mistreatment is part and parcel of an overall package of deprivation that continues to plague the Palestinian people. There are some 2 million residents in Gaza affected by this egregious policy, famously one of the most densely populated areas on the planet. Gaza’s water resources are fully controlled by Israel and the division of groundwater is something that was provided for in the Oslo II Accord. However, despite the fact that under the Accord Israel is allocated four times the Palestinian portion of water resources, it has been revealed that Israel has been extracting 80 percent more water from the West Bank than it agreed to. In 2009, the World Bank wrote that the responsibility was on the government of Israel to recognize that water and sanitation is a central component of the Gaza Strip humanitarian crisis and make arrangements to facilitate fuel distribution to some 170 water and sewage pumps in Gaza; maintain the Beit Lahiya Sewage Lake; and restore regular electricity supply in order to reduce dependence on fuel for generators. According to the World Bank, at the time, almost all of Gaza’s population was without running water and was dependent on stored water supplies. The World Bank also noted that nearly all sewage and water pumps were out of operation due to lack of electricity and diminished fuel supplies, something that we will address below. But once again, these deficiencies fall squarely on the shoulders of the Israeli government, which is wholly responsible for Gaza’s electricity and water supply. In order to rectify the issue, the Deputy UN Special Coordinator for the Middle East Peace Process, Maxwell Gaylard, called for the immediate opening of Gaza’s crossings to allow the entry of spare parts and materials critical to the restoration of Gaza’s water and sanitation services. Israel famously closed Gaza’s crossing points in June 2007 and the local population has been suffering ever since. However, there are many other factors that have helped to create this humanitarian catastrophe. Israel routinely unleashes bombing campaigns on the Gaza Strip every few years, targeting vital infrastructure, including destroying Gaza’s only power plant in 2014. The blockade single-handedly prevents vital materials and equipment from making its way into Gaza, making redevelopment impossible, even some four years later. According to the United Nations Relief and Works Agency (UNRWA), the Gaza Strip endures dry, hot summers that are subject to drought. Exploiting these conditions, Israel has used electricity as an inventive point of leverage to torture the Palestinian people, while the international community has stayed largely silent. This is the same international community that cites human rights abuses in Syria, Iran, and North Korea to promote military intervention and regime change to suit its geopolitical needs, yet stays silent as 2 million Gazan residents are suffering immensely in what is widely regarded as an open-air prison and the world’s largest ghetto. On a good day, residents in Gaza over the last six months have been receiving three to four hours of electricity per day, the flow of which is controlled by Israel. However, according to the Times of Israel, Gazans were only able to obtain four hours’ worth of electricity thanks mainly to fuel supplies sent from Egypt. 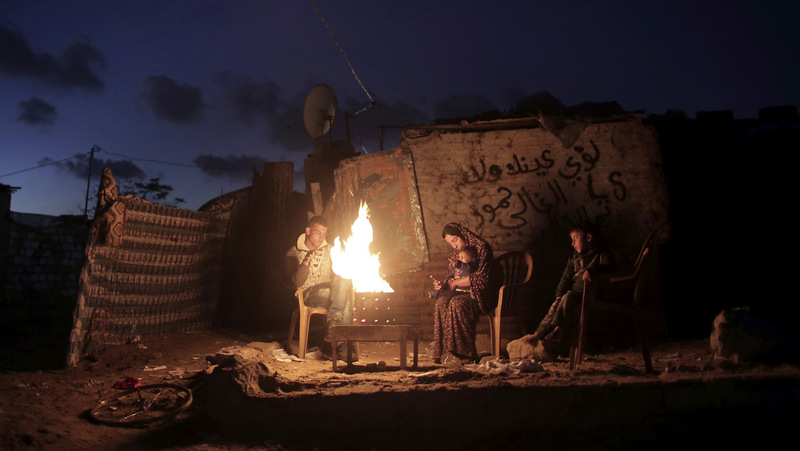 On a bad day, some estimates cite that Gazans have been receiving as little as two hours electricity per day if any at all. After the Palestinian Authority said it would begin resuming payment for Israeli electricity flows to the Gaza Strip (at a cost of some $2.8 million per month), Israel announced it would restore its share of the electricity supply. However, this will increase Gaza’s electricity supply only to approximately six hours’ worth of electricity per day. The outage of electricity is expected to last for 12 hours a day at least, according to the Electronic Intifada. One should bear in mind that, with a Gazan population of around 2 million residents, the effects of this stringent electricity supply are felt far beyond just the average household. In August of last year, Gaza’s children’s hospitals also warned of a health “catastrophe,” as power cuts routinely take place during four-hour-long dialysis treatment. For years, Israel has attempted to shed blame from its inhumane policies and instead point to the debacle solely on an internal Palestinian issue between the Palestinian Authority and Hamas. Last year, Human Rights Watch’s director for the region, Omar Shakir, told the right-wing pro-Israel publication Algemeiner that because Israel is “legally the occupying power,” it bore the brunt of the responsibility for this crisis. “Israel controls the borders, the airspace, the waters of Gaza, so Israel has an obligation that goes beyond merely responding to a request from Palestinian authorities,” Shakir reportedly said. A Palestinian girl walks next to destroyed houses, in the Shijaiyah neighborhood of Gaza City after a devastating bombing campaign by Israel in March of 2015. Rather than heeding the warnings from the UN to open up Gaza’s blockade and allow vital aid, what we have witnessed over the course of the last decade is a periodic all-out assault on Gaza’s vital infrastructure. Since the blockade was enforced, there have been three major IDF operations in Gaza: Operation Cast Lead in 2008-2009, Operation Pillar of Defense in 2012, and Operation Protective Edge in 2014. Following Operation Cast Lead, the World Bank reported that there had been severe damage to the water and sanitation infrastructure in the Gaza Strip. Will Washington’s Syria Chess Game Lead to War with NATO Ally Turkey? After Operation Protective Edge in 2014, the UN reported that more than 20,000 Palestinian homes, 148 schools and 60 healthcare centers in Gaza were damaged or destroyed. Israel even bombed a disability center at the time. 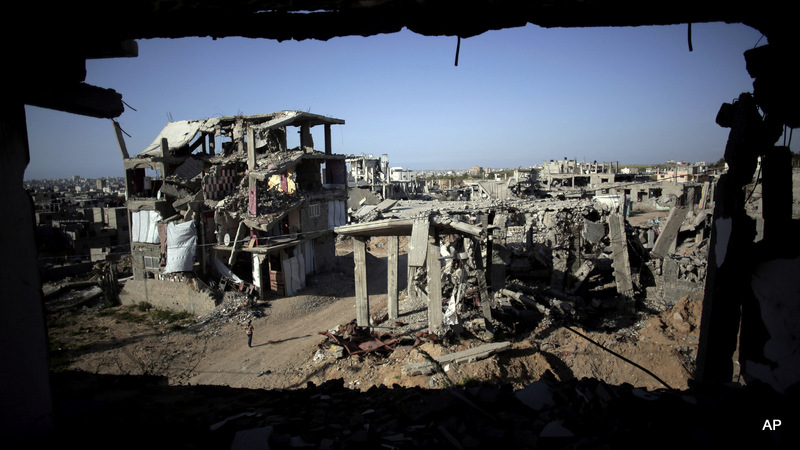 Gaza has no air force, no air defenses, and no substantive military to defend its people. While most pro-Israeli pundits would point to Hamas rocket fire as an excuse for the interventions, the truth on the ground tells a different story. The Submission to the United Nations Independent Commission of Inquiry on the 2014 Gaza Conflict, published by Truthout, quite clearly demonstrates that Israeli airstrikes and ground attacks preceded Hamas rocket fire; and that Hamas rocket-fire had been nonexistent since Israel’s previous assault in 2012. In other words, Hamas had been abiding by its terms of the ceasefire — even while Israel had been starving Gaza of basic human rights, as argued and outlined above. Further, in July 2014, The Guardian published a blog by investigative journalist Nafeez Ahmed, which claimed Israel’s brutal assault on Gaza in 2014 was rooted in a desire to control Palestinian gas off the coast of Gaza and had nothing to do with concerns about Hamas rocket fire. The Guardian axed his blog not long after. Israel modus operandi has been to attack Gaza by punishing the civilian population with these heavy sanctions affecting its basic life necessities. It is almost as if the Israeli government has been attempting to provoke a response from the Gaza Strip, which could then be used again to justify yet another intervention — given it has been proven that Israel has lied about its stated reasons for intervention in the past. This response, however, never came in the form that Israel might have hoped for. U.S. President Donald Trump’s decision to unilaterally declare Jerusalem the capital of Israel, inflaming an already tense situation, was the political icing on the cake of Palestinian suffering. Regardless of one’s views on the Israel-Palestine conflict, which continues to divide people all along the political spectrum, the fact remains that this decision alone pushed an already volatile situation to a point of outright violence. According to Reuters, since Trump’s infamous decision, at least 13 Palestinians have been killed in clashes with Israeli forces. Further, it wasn’t long after Trump’s announcement that Israel began resuming air strikes in the Gaza Strip. Perhaps this is a sign of things to come in the not-too-distant future. While tensions are heating up between Israel and Syria, Lebanon and Iran, it has been largely overlooked that Hamas and Israel are preparing for an imminent war even as we speak. In 2015, the UN predicted that Gaza would become uninhabitable by 2020. Not pulling any punches, the UN concedes the cause of this crisis is based on two important factors: Israeli military operations and the decades-long blockade that has crippled Gaza’s economy and infrastructure. Reportedly, Gaza has an unemployment rate of some 50 percent, the highest unemployment rate in the world, with a youth unemployment rate of at least 60 percent. No matter how one cuts it, whether Israel has been intentionally trying to elicit a response from Gaza or not, the fact remains that the Israeli government is intentionally pursuing a long list of policies that will almost certainly lead to a hostile escalation, as the international community continues to turn a blind eye to the everyday suffering of the Palestinian people. Israeli policies indeed border on a systematic genocide that will, if unchecked, completely erode the Gaza Strip to nothingness in just a few short years.